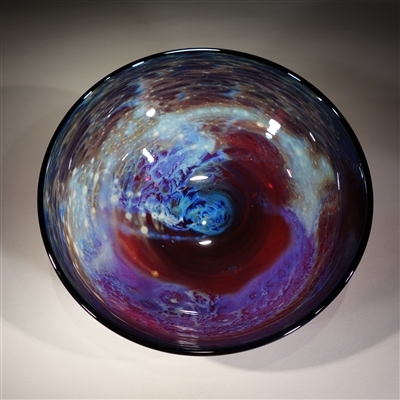 "I started making Ruby New Mexico Glass just recently, after discovering several barrels of red cullet (broken glass shards) that I had bought from the Fenton Glass Company in 1975 but couldn't use because it was incompatible with my clear glass at the time. Four decades later, this cullet turns out to be perfectly compatible with the clear glass that I use now, so we've been experimenting with a lot of new shapes, sizes, and patterns. Ruby New Mexico glass appears red in transmitted light, while at the same time it reflects the vibrant blue hues and patterns of my classic New Mexico glass." 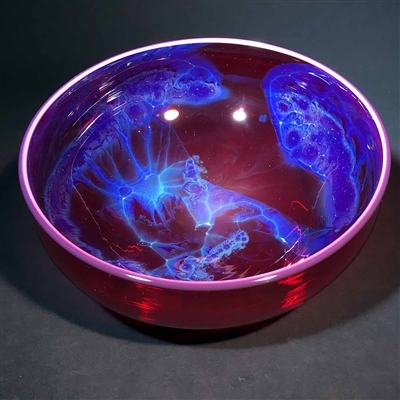 Josh Simpson | Ruby New Mexico Bowls: Handmade blown-glass bowls of ruby glass with applied reactive silver.